The excitement around virtual reality (VR) is enormous… it is EVERYWHERE! From commercial applications to domestic uses formerly reserved for gaming, it is now filtering into everyday tasks and available on devices a lot of us carry around in our pockets. In an interview with FARO’s Construction Product Manager, Oliver Buerkler, we look at the reasons behind this move and the opportunities it affords the user. As an opening statement Buerkler muses “whilst we are sending our children virtually to the moon to learn, we are building not too differently to the Egyptians” – it’s a dichotomy he sincerely hopes will change. In built environment industry BIM terms it can be seen as the low-hanging fruit of opportunities afforded by designing using BIM authored models as it (conveniently for some) sidesteps having to deal with the ‘data delivery’ side of a true BIM process. As a communication tool, however, it’s a much more engaging way of portraying an environment than a set of 2D views. Many ‘non-industry’ people (and some within the industry) struggle to read and interpret 2D drawings, sometimes resulting in things being built that were ‘signed off’ without necessarily being fully understood. VR breaks down this barrier, enabling a much more natural and less abstract communication with clients and other stakeholders and can subsequently demonstrate financial and potentially life-saving benefits (more on that later). When questioned on what made this evolution possible, Buerkler states “advances in commercial and domestic VR viewers meant that there is now an audience for this type of deliverable… providing the content to be viewed was a common-sense development”. Indeed so much so that the ethos behind the development was to create ‘VR with no extra end-user effort’. Not only this but in an industry-leading approach, the software can import scan data recorded using any other hardware and then viewed with a headset. In commercial terms, Buerkler is looking to extend the use of scan data, bringing it forward into the client /public domain as well as increasing its use through design, construction and into the operation of a built environment asset. FARO’s first mainstream foray into the provision of virtual worlds is through the use of FARO Scene 7.1 software. Traditionally their documentation software for terrestrial and handheld scanning hardware it is clear that ‘documentation’ has moved on and now caters for the evolving demands of the industry’s current generation. 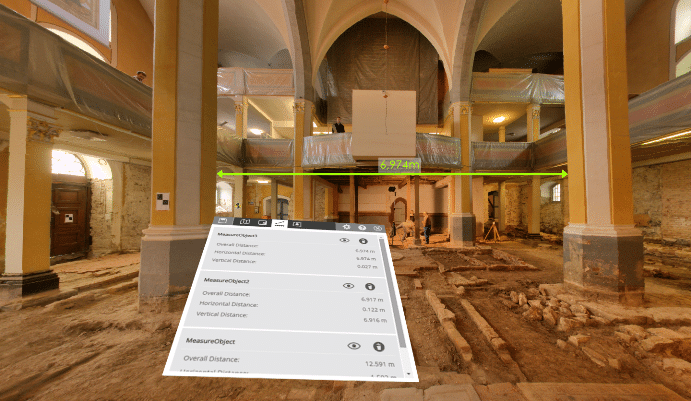 The new enhanced Virtual Reality functionality permits viewing project point clouds in full detail; users can currently select between Oculus Rift or HTC Vive headsets to experience and explore on-site situations back in the office in an immersive environment. It’s easy too! The VR feature is an integral feature of Scene; clicking the ‘VR View’ icon, the view opens and is then driving the headset directly. Democratising the survey data at the very beginning of a project places intelligence with stakeholders, earlier. Maybe not necessarily in terms of the equipment required but in terms of them ‘understanding’ what is being described it enables viewers to make more informed decisions about the surveyed site. As a side note, Buerkler states that as someone who has stereo-blindness (he is one of a proportion of the population who cannot perceive depth) the VR headset environment feels natural – it’s so much more real than flat, screen-based viewing. It is “simply a game changer” for him. This solution is essentially a new viewing feature for software that many of FARO’s existing survey customers already use – potentially meaning that there’s no cost for the end user who already has their own VR headset. When viewing the scan data in an immersive environment, users can freely ‘wander’ the surveyed site. Rather than the ‘model’ being created by a gamer, what they are seeing is the same accurate data that drives any 2D deliverables. In this scenario however, the user can interrogate the survey in whichever manner they choose and in complete safety – not to mention avoiding inclement weather in the comfort of their own office! The ability to view an environment in a natural way by peering around corners and looking up and down is a far more natural way to appreciate the details (intricate or otherwise) of any space. 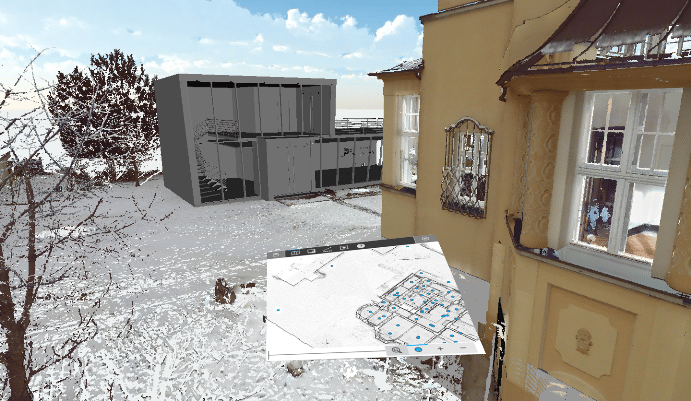 The measurement/interrogation tools currently available to the user whilst viewing the data are useful and will build as the features mature – one can envisage perhaps checking as-built models against as designed BIM data sets, whereby any built elements beyond a given tolerance are highlighted – an exciting prospect! During construction and operation these tools have the ability to offer increased health and safety standards through a number of scenarios. Construction phasing can be better understood with frequently updated survey data, enabling site workers to understand the current state of construction and experience the site before undertaking any work. Technically difficult work can be practiced in a fully virtual environment ensuring the user is then familiar with the site ahead of the physical work. In operation and facility management particularly, workers attending a facility to undertake routine or emergency repairs can do so having ‘seen’ the environment they will be working in, checked the particular access difficulties (if there are any) and prepared themselves to swiftly and efficiently carry out the work. Buerkler states “the obvious step is to enable viewing of new design projects or alterations within the same tool, this will allow a more complete and accurate view of how new and existing fabric or components interface with one another and to make design changes before they appear as costly corrections on site”. Beyond that, there are numerous possibilities but it’s fair to say that FARO are keeping a close eye on short and long-term technology developments to see how they might manifest themselves in their future customer solutions.